Whether it’s a birthday, wedding or corporate event, organizing a party is a stressful task, you need to pay attention to every small detail from creating a festive atmosphere to making your guests comfortable and serving them delicious food. The last thing you could think include mistakes, delays, and unexpected errors, but such things often happen. Among all, catering is the most important aspect of throwing a large corporate party. 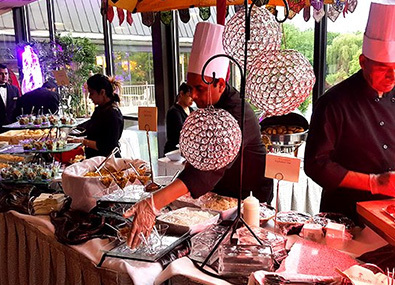 We, at Benares Caterers offer excellent Indian catering for corporate parties in Connecticut so that you can enjoy your party without being worried about catering services. However, with wrong catering services, you may end up leaving your guests disappointed and unhappy about the party arrangement especially food and organization. Therefore, make sure your event is catered to the highest professional and reputable caterers of your place. To do that, below we’ve explained common mistakes people make when hiring catering services for corporate parties. Choosing a company with under-trained staff – Well, not every catering company in the business takes it as seriously as needed. Catering is a highly specialized business, which demands disciplined training. You wouldn’t want to hire people who lack professional training to catering your corporate party. Arrangements such as the transport, setting of the tables, setup of equipment, and preparation of food, require staff who are committed to professionalism and detailed-oriented. Such skills come only if all the stall members went through culinary and logistical training. Most reputable catering companies employ people who are well-trained by good culinary institutions. Therefore, before you commit, make sure to ask the company about their staff training and skills. Failing to consider ingredients – If you’re planning to hire Indian catering for corporate events in Long Island, ingredients play a crucial role to enhance your food. The caterer you’ve chosen might do everything from presentation to service, but if the food fails to match the expectations, it will leave your guests with disappointments. For this reason, it’s crucial to hire a company that comes with a commitment to the finest ingredients, preparations, and products. Before you take a final decision, make sure the catering company you’re considering knows the importance of quality ingredients for you. Also, ask them from where they get these ingredients and how they prepare the food. Not being on the same page – You might have liked the menu that caterer has offered to you, but, did they take the initiative to know the type of party you’re planning? Do they know the style, decor, venue, and thematic elements involved in your event? If a company is taking no or little interest in all these details, then you must keep your search going. Go for catering companies that put extra effort to understand the kind of party throwing so that they can offer the best catering services as you like. Finally, choose a company who shows interest in knowing all about your party, and consider a meeting between the caterer and other professionals who will work for your event. Are you looking for the best Indian catering for corporate parties in Connecticut? Feel free to contact us: 212 967 0400.